Welcome to Tool Time Construction, Inc.
Tool Time Construction, Inc. provides a wide selection of kitchen cabinets and countertops, including KRAFTMAID cabinets, and granite countertops. We have completed thousands of successful kitchen and bath remodeling jobs in San Diego County since 1993. Being a family owned business, you can expect attention to detail in all facets of your kitchen and bath remodel project. Our certified designers use 3-D CAD design drawings. Combined with our in-house installation crew, we can take your job from concept to completion. Perhaps you haven't heard of us before. That may be because we have installed over 7,000 kitchens and baths under the name of major companies, including Home Depot, Home Depot Expo, B.R.E. Properties, Home Base, IKEA, and Lowe’s. Now you can go direct to the source and choose from hundreds of door styles and finishes. Our design team can customize your kitchen and bath to meet your standards of PERFECTION. 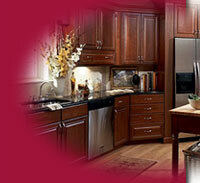 Come visit our kitchen showroom, or call us for a FREE consultation.